ANGKOR AWAKENS: A PORTRAIT OF CAMBODIA offers an intimate look at a country who has reached a political and cultural tipping point. We are shown the current state of Cambodia through the veil of the country’s brutal history. Living in the wake of the Khmer Rouge genocide (1975-1979) we see a nation, whose people are fighting to reconcile their past while demanding change for their future. The present-day repression in Cambodia lives on as a reminder of the country's not too distant past, but a new generation of Cambodians are demanding change for their country and its people. The film is comprised of deeply personal interviews, including one with Prime Minister Hun Sen.
Operation Menu, the codename for a secret bombing campaign conducted by the US in Cambodia between 1969 and 1970 set the stage for the rise of the Khmer Rouge. An organization who is best remembered for orchestrating the Cambodian genocide. Combing elements of Marxism with an extreme version of Khmer, nationalism, and xenophobia the Rouge's ideology was a powder keg waiting to be ignited. Director Robert H. Lieberman’s first-hand experience with the Holocaust has led him to explore the effects of the genocide on today’s young Cambodians. He said he was"initially drawn to Cambodia because I was curious to see if there were any lingering effects of the Khmer Rouge genocide in today’s young people. I was determined not to make a doom and gloom movie. Rather, I wanted to provide a sweeping portrait of the country, its people, and history, its politics and psychology. Of course, there was no way to avoid Cambodia’s darkest period." The most illuminating interview in the film is with Hun Sen, Cambodia’s Prime Minister who apparently rarely gives interviews. That conversation offers a chilling look at the source of the current oppression facing the Cambodian people. Choosing to shoot the film himself, with available light, Liberman creates an environment comfortable enough for his subjects to open up in a deeply personal manner. 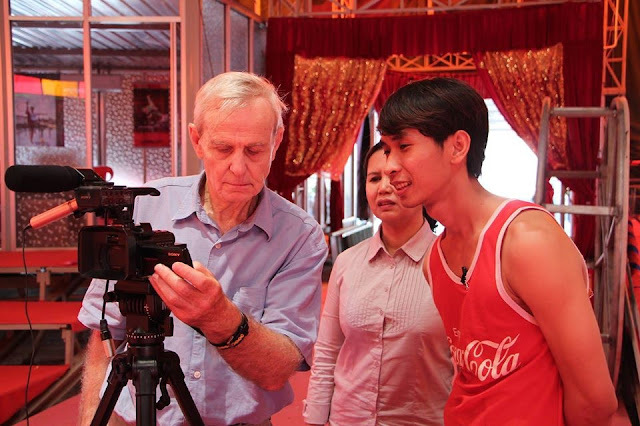 His intention "is that this is a story of hope and recovery told through the Cambodian people— the young and old, artists and teachers, politicians and just plain ordinary people." We as an audience are forced to come to grips with Nixon and Kissinger’s secret bombing and incursion into this neutral country that helped set the stage for the rise of the Khmer Rouge. Sadly ANGOR AWAKENS is an important and enlightening reflection of our current political climate.